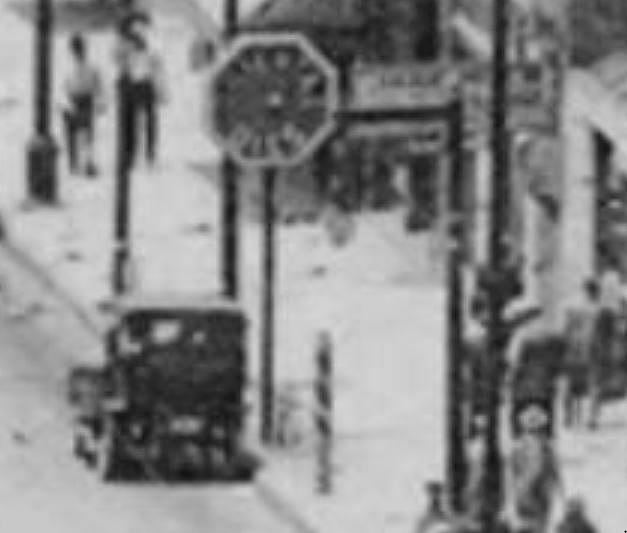 I cropped this detail from a much larger view of Commerce Street because this incidental, everyday moment caught my attention. Was that man filling his automobile with gasoline? Was that square, boxy, hip-high thing full of gas, right there at the curb of one of the city’s busiest streets? 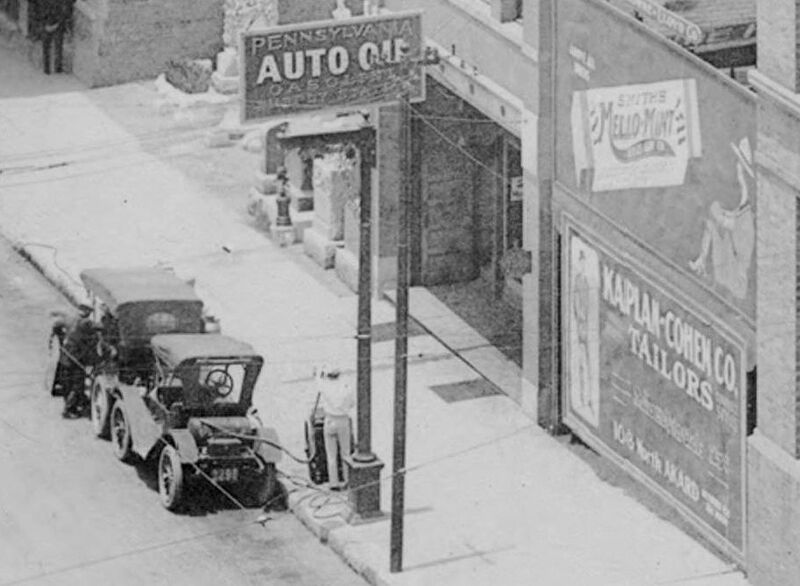 The sign above the pump reads “PENNSYLVANIA AUTO OIL GASOLINE SUPPLY STATION.” I looked into it, and now I know more about early gas pumps and stations than I ever thought I would. Drive-up “stations” had begun to appear a few years before, on the West Coast. Dallas’ first gas filling station had a one-gallon blind pump on the curb which was then thought to be the last word in equipment. Now if a filling station is not equipped with a visible five-gallon pump it is thought to be behind the times and the gas now sold must be water white, when in the old days it was most any color. When it was empty, it would be rolled away to be re-filled. I’m not sure about the payment system. Coupon books are mentioned in one of the ads, but I don’t know how (or with whom) one would redeem them as these pumps appear to be self-serve. Perhaps there was a slot for coins/coupons, and everyone worked on the honor system. It seems that its placement would cause a lot of congestion on a major street like Commerce (which at the time was still shared with skittish horses), but Commerce was also a hotbed of automobile dealerships (Studebaker, Stutz, and Pierce-Arrow dealerships, for example, were within a couple of blocks of the Oriental and Pennsylvania filling stations). They were a fast-growing oil company (“an independent concern which in spite of the strong opposition of the oil trust is now enjoying permanent and growing prosperity” – Greater Dallas Illustrated, 1908), and they were one of the first to open a refinery in Texas (they eventually had two refineries in West Dallas). The company’s primary concern in its early years was the manufacture of various oils and greases for industrial use. In 1911, understanding just how profitable the new world of retail gasoline sales could be, they installed their first pump at the curb of 1611 Commerce St., near Ervay (“right behind the Owl Drug Store”). 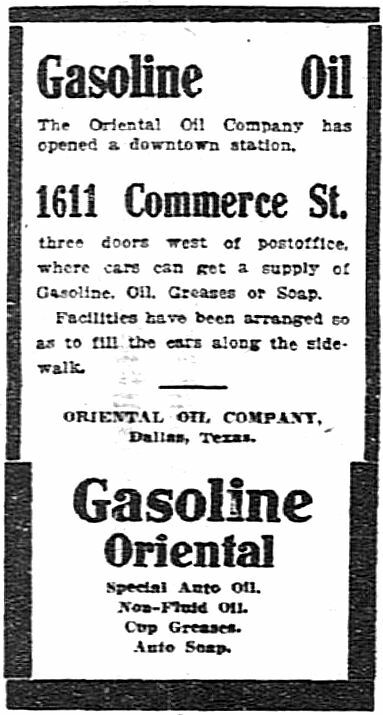 A 1924 Dallas Morning News account of the company (see below) states that this was the first gas pump … not only in Dallas … but in the entire state of Texas. 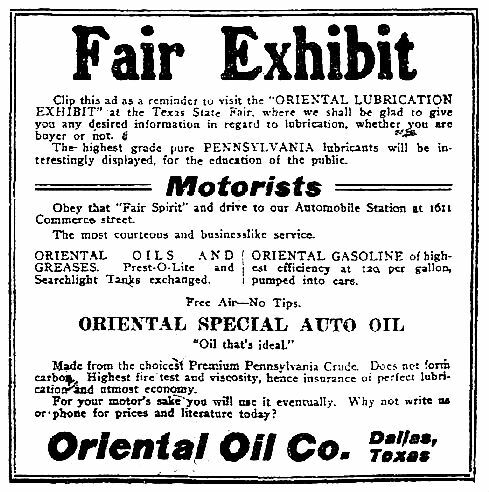 I’m not sure if that’s true, but the Smith Brothers who ran Oriental Oil were certainly go-getters — the Smiths were grandsons of Col. B. F. Terry, organizer of the famed Terry’s Texas Rangers, and one of the brothers, Frank, was an early mayor of Highland Park and a three-term president of the Dallas Chamber of Commerce. Newspaper reports also cite claims made by the company that the station mentioned in the ad above — at Commerce and Prather — was the first drive-in gas station in the United States. I’m sure this was good truth-stretching PR for Oriental more than anything, because this claim was not true (Seattle and Pittsburgh seem to be battling each other for that honor). 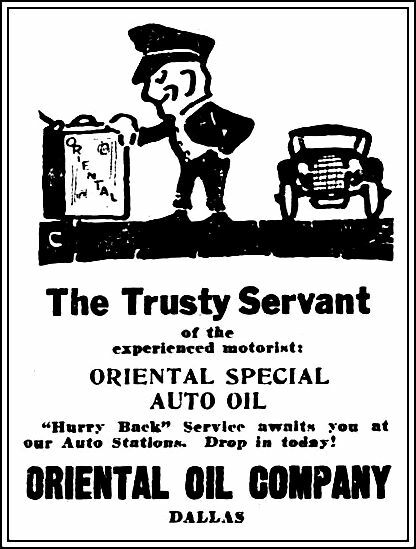 It might not have been the first, but when this “auto station” opened in 1916 (assuming it was “new” as this ad states), it was still pretty early in the history of the drive-in filling station. Also, by 1916, “Hurry Back” had become the company’s slogan as well as the name of its gasoline. 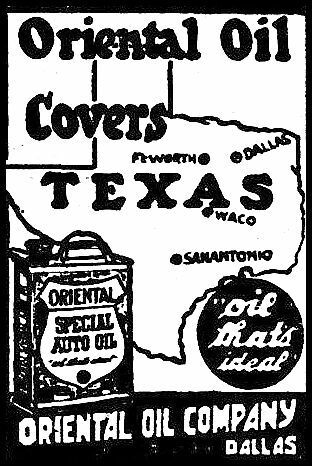 By 1927, the company boasted at least 18 filling stations, two refineries, and branches in Fort Worth and San Antonio. In 1927 they had moved into new offices in the “Oriental Building” at the nexus of Live Oak, St. Paul, and Pacific. A newspaper report described the building as being “finished in Oriental colors with Oriental decorations and is marked at night by very attractive lighting” (DMN, May 1, 1927). 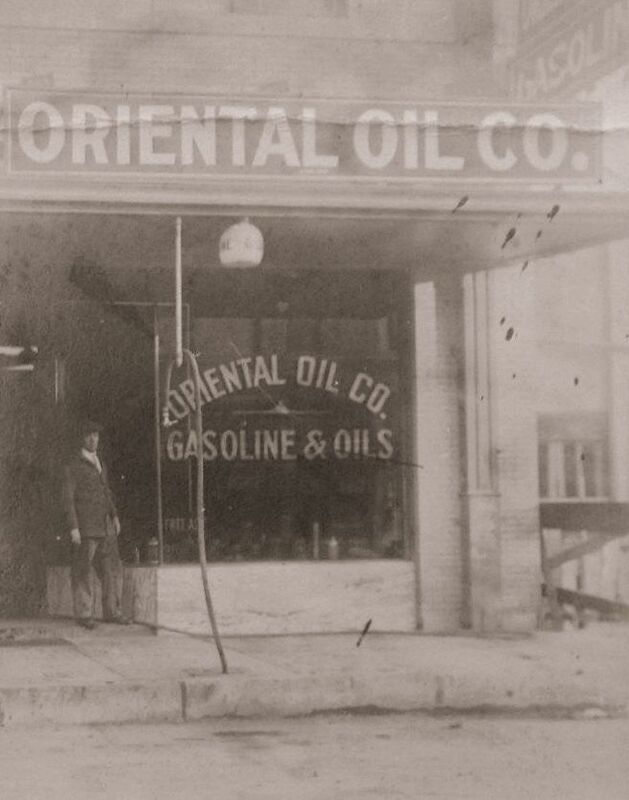 The Oriental Oil Company declared bankruptcy in 1934, selling off their property, refineries, and their name. No more Oroco gas. 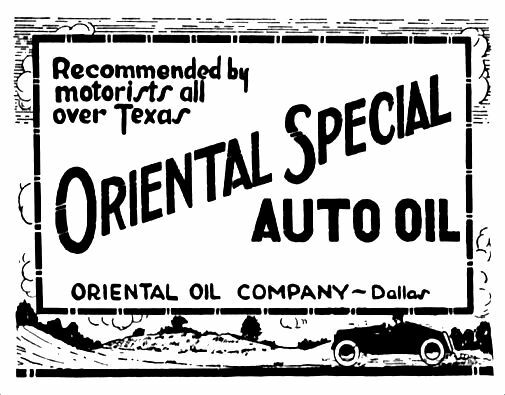 A lot of companies went bust during the Great Depression, but I’m not sure what precipitated Oriental Oil’s bankruptcy. 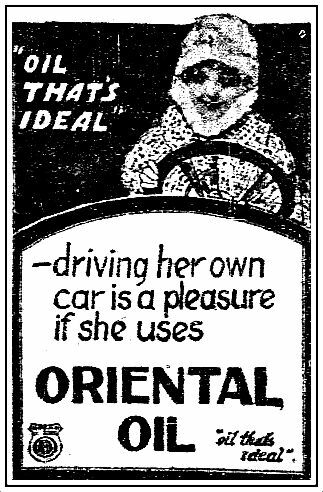 Actually, I’m surprised by how little information about the Oriental Oil Company I’ve been able to find. Afterall, it and its “Hurry Back” gasoline played a major role in getting the residents of Dallas off their horses and behind the wheel, a major cultural and economic shift that changed the city forever. And it all started at that weird little curbside gas pump on Commerce Street. The first two images are details of a photograph by Jno. J. Johnson (“New Skyline from YMCA”), 1912/1913, from the DeGolyer Library, Central University Libraries, Southern Methodist University, viewable here. Snippet of text from A Field Guide to Gas Stations of Texas by Dwayne Jones (Texas Department of Transportation, 2003). Illustration of the two 1913 Tokheim portable gas pumps from An Illustrated Guide to Gas Pumps, Identification and Price Guide, 2nd Edition by John H. Sim (Iola, WI: Krause Publications, 2008). Drawing of the Oriental Oil Company Factory from Greater Dallas Illustrated (Dallas: American Illustrating Co., 1908 — reprinted by Friends of the Dallas Public Library in 1992). All ads and articles, unless otherwise noted, from The Dallas Morning News. Color photo of the pink, purple, and gold Oriental Oil Bldg. is a detail from a photo taken around 1977, on Flickr, here. 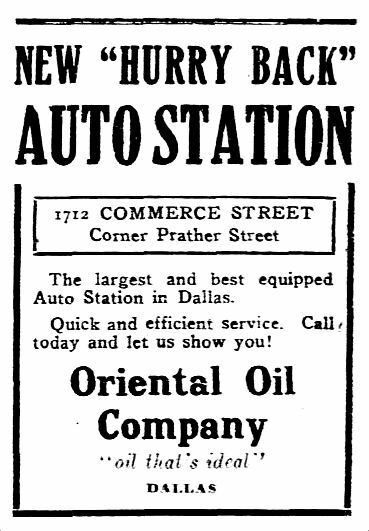 For an interesting (and mostly accurate) mini-history of the Oriental Oil Company, then in its 20th year of operation, see the Dallas Morning News article “First Dallas Filling Station on Commerce Had One-Gallon Pump” (June 22, 1924). Some nifty info on early gas stations (yes, really) here. More info with some really great illustrations and photos here. Another surprisingly fun and informative article is here.